We hear the phrase “don’t be afraid to get back on the horse” when we stumble, but what does that actually mean for an entrepreneur? Should we pursue the same business, do something else (aka get on a different horse), or give up altogether? These are the kinds of questions I address in detail when discussing the future of my own business, Ucraft Brew. While nothing is set in stone, I think for the time being, my journey with Ucraft is done. After losing two different rounds of funding, this might just be one horse I don’t want to get back on. In reflecting on my own journey, I ask myself the questions that every entrepreneur should when considering whether or not to keep pursue their business. Is entrepreneurship right for me? Am I truly passionate about what I’m doing? Is my idea creating value for others? Is my team passionate about what we’re doing? Should I move on to something else? Rather than just blindly continuing to do something for the sake of not giving up, these are things entrepreneurs should ask themselves to help ease the process and possibly save a lot of time and money. Because let’s face it, no one is ever going to be as passionate about your business idea as you, it takes passion to succeed, and if you’re not creating enough value for others, the idea will never take off. So check out the video and see for yourself. 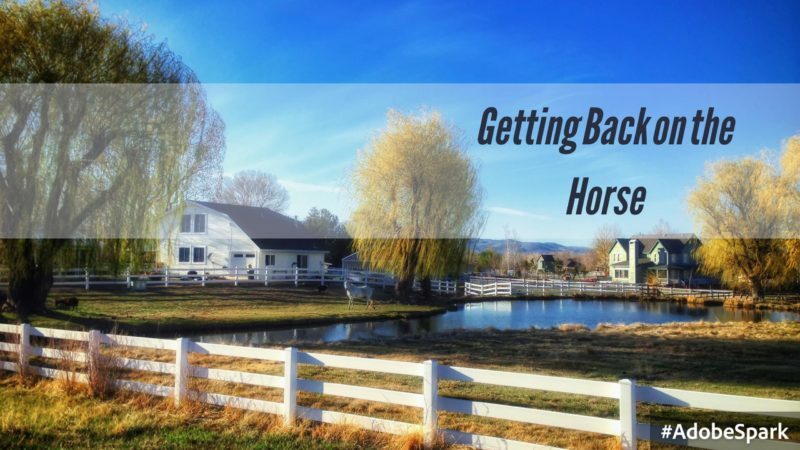 Have you had to “get back on the horse” in business? Please share in the comments below!